It's 2040. 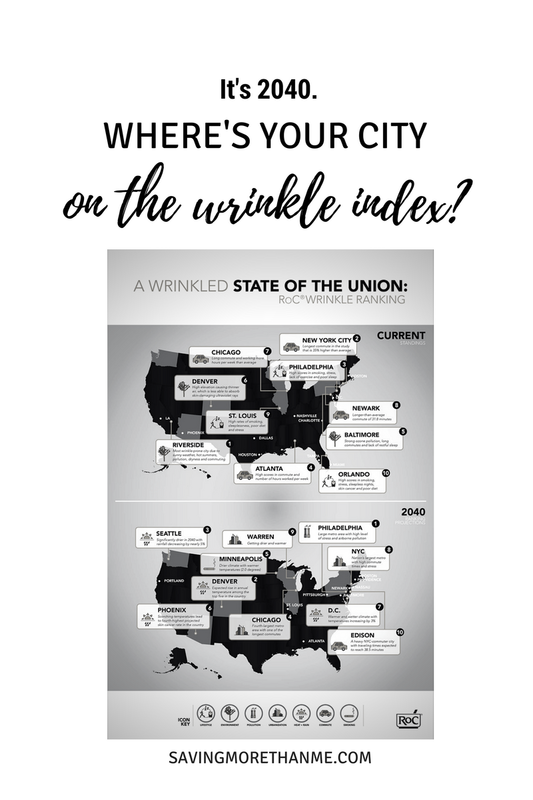 Where's Your City On The Wrinkle Index? You're here » Home » Fashion + Beauty » It’s 2040. Where’s Your City On The Wrinkle Index? It’s 2040. Where’s Your City On The Wrinkle Index? This post was sponsored by RoC® Skincare as part of an Influencer Activation for Influence Central. All opinions are my own. I have to give it to you straight: I’ve been feeling old lately. Between my thinning hair, my new title of grandma, and the lines on my face, I’m feeling all 45 years of life. I know that this feeling is temporary and something that comes with aging but that doesn’t mean I have to like it. I don’t want to look it either. Old, that is. Despite my whining, I’m not in search of the fountain of youth or even a plastic surgeon. I’m simply in search of how *not* to look older than my age. Truthfully, I’d be happy if someone told me that I looked like I was in my 30’s! With the exception of too many sunburns in high school and not removing my makeup before bed (in my late teens), overall I’ve taken good care of my skin. I know that an act of prevention today will lead to positive results in the future. But, how far into the future? Now come in real close because I’m going to whisper this…once. In the year 2040, I’ll be 70 years old. S-E-V-E-N-T-Y. Why am I focusing on that particular year anyway? It’s because RoC® Skincare and Sperling’s Best Places performed an analysis of existing research in order to determine an overall Wrinkle Index score so they could rank metro areas in the US. In other words, RoC® Skincare and Sperling’s Best Places determined the cities most at risk of skin damage and premature aging for the year of 2040. Say what?! 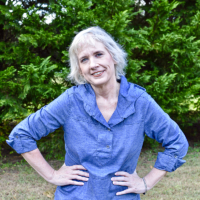 I currently live in Richmond, Virginia and it’s not on the wrinkle-prone list, however, Washington D.C., where I spend a lot of weekends, did make the list. It’s number seven (part of the top 10) due to the city’s urban environment of congested commuting and lower air quality. While genetics and lifestyle (hello, stress!) play a role in how our skin ages, environment and geographic location does also. One of the ways that we can help combat the signs of aging is through quality skin care products. 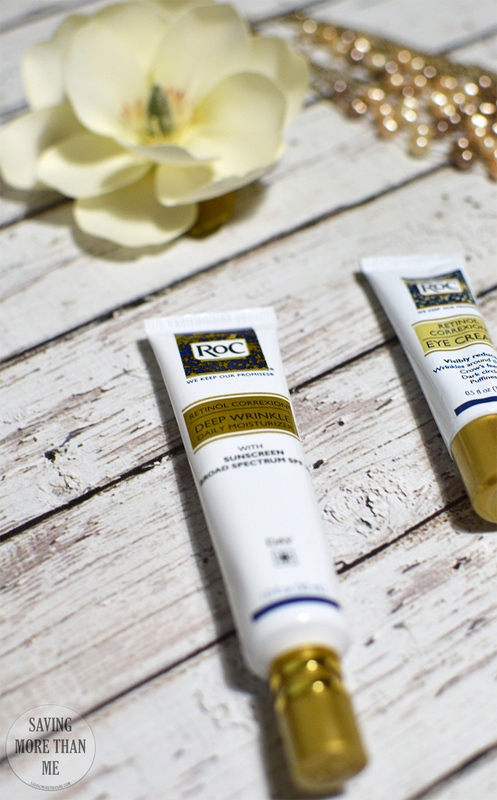 RoC® Skincare has been a leading French skin care brand for more than 50 years and they’re devoted to developing anti-aging products with a visible and lasting impact so you and I can have healthier (and healthier looking) skin. They were the first brand to patent pure retinol in a cosmetic product which in case you didn’t know, retinol is the ninja for wrinkles and fine lines. Both products are unscented (yay! ), hypoallergenic, and oil-free. RETINOL CORREXION products are also packaged in special aluminum tubes that protect the retinol in the product from light and air. This helps keep the retinol in a stable, pure form. Since I’m going to be 70 in 2040, I want stable and pure in an anti-aging product. I think I want luxurious also because that’s the way these two products feel on my skin. 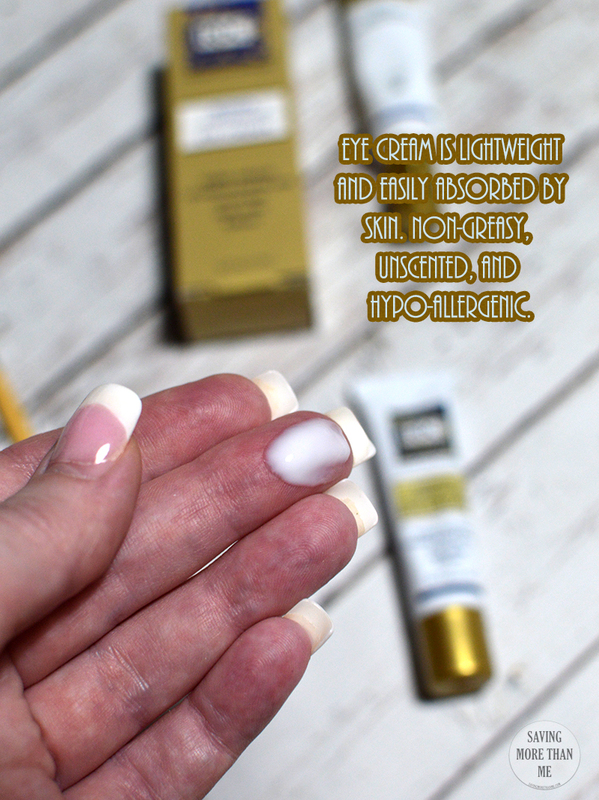 They’re both silky smooth, not greasy, quickly absorbed, and full of ninja fighting retinol. Maybe I’ve got this anti-aging thing down after all. How did your city/county fare on the RoC® Wrinkle Prone List? How do you plan to combat the effects of environment and lifestyle on aging? At 36 it’s time to start thinking about a wrinkle cream. 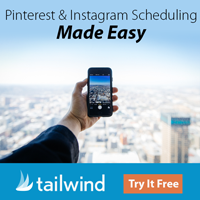 I need to check this one out! I had no idea some cities were worse than others. That is fascinating! I have these exact products and love them! I need to get so much better at taking care of my skin. I live in Wisconsin now, but grew up in San Diego California. I grew up in the sun, all the time. I am only 31 so no wrinkles yet, but with me most likely having sun damage they will come. Time to start taking care of things now! I’m in NY, although not in the city, but close enough. 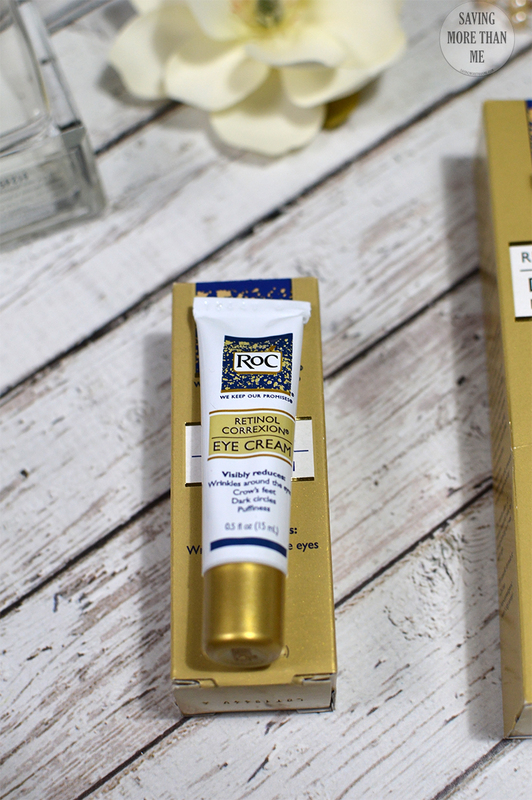 ROC makes a quality product and I believe prevention is the best way to keep wrinkles at bay! I am not sure where my city is, but I know where my wrinkles are! I would like them to be less visible! I will have to check this out the next time I am at the store. I have heard of the product but have never tried it. I think it is time to check into it. Wrinkles are part of getting older I know. But why do men get lines of distinction? Double standard isn’t it Maria? Ugh.